TWO chefs from 16 Air Assault Brigade have been doing their bit for those less well-off by cooking a weekly dinner for 20 residents of a local shelter. The voluntary project, which has been running for a year, has also seen the chefs re-organise Colchester Night Centre’s kitchen and stock keeping. 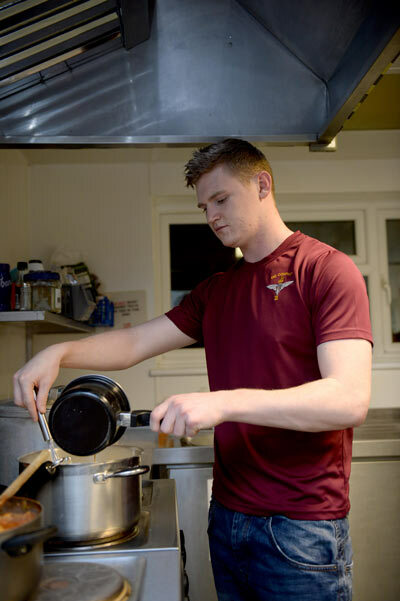 Corporal Sam Coote and Lance Corporal Callum McMullan have been cooking up dishes such as chicken soup, spaghetti bolognese and chocolate sponge and custard. Cpl Coote, 24, said: “I look forward to coming down to the Night Shelter when it’s my turn. It’s an easy way to use our skills as chefs to give something back to the community. LCpl McMullan, 23, added: “Day to day as an Army chef we’re cooking in the messes on camp and preparing to cook out in the field on exercises, so this gives us a chance to do something different with our skills. Alastair Leighton, Colchester Night Shelter Resettlement and Welfare Worker, said: “The Army chefs have been a real enhancement to the centre and the network of volunteers who support us.